Our Super Duty Starter System was engineering and developed to deliver a 4.5" Super Duty Lift, with massive gains in ride quality and comfort. 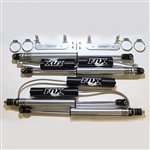 Fox 2.0 IFP front shocks for the 2014+ radius arm trucks are valved for Thuren soft rate coils and offer great ride quality with affordable pricing at $269 a pair! Our Super Duty Starter System was engineering and developed to deliver a 4.5" Super Duty Lift, with massive gains in ride quality and comfort. 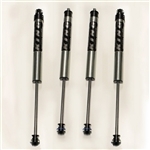 Carli Starter Shocks (Bilstein 5100) have custom ride quality 5100 shock tune specifically matched to Dodge HD Trucks for 3 inch lift heights. Bushing to bushing direct-fit OEM replacement. Our Super Duty Starter System was engineering and developed to deliver a 4.5" Super Duty Lift, with massive gains in ride quality and comfort. KING 2.0 IFP shocks are designed to be as smooth as possible on rough highways, small to medium square-edge bumps, high speed gravel washboard roads, and slower crawling type driving.